A brand new student organization is coming to campus this fall for women interested in science, technology, engineering and other related fields, called the URI Women in STEM Club. Sexism against women pursuing STEM professions is a real issue in our world today and students are taking a stand. Hannah Willey and Ellie Dunkle, both in their fourth year of a five-year ocean engineering program, are looking to create a positive, supportive place for females in the sciences to lift eachother up through the initiation of this student organization. The organization began as a conversation between two friends. “Ellie and I were talking about societal equality one day, and the conversation eventually turned to what it’s like for us as women in engineering, and how we must fight for respect from our peers and to prove that we have legitimate ideas and solutions,” said Willey, co-founder of URI Women in STEM. 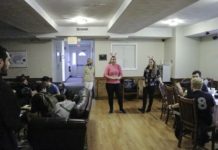 “We tried to think of what would help us feel a little less hopeless in advocating for ourselves [in our fields], even though our male counterparts inherently didn’t have to,” said Dunkle, co-founder of the student organization. “URI Women in STEM is a club for intelligent women who do not fear, but support, other intelligent women, because we are stronger together,” said Dunkle. The club began as a private Facebook group, created in January of 2017, called URI Women In STEM. It currently has 117 members and all are encouraged to join. Coordinators of the club page are planning to make the club a reality by fall semester, 2018. “Anyone who has felt judged or belittled because of their race, age, gender, religion, or anything else is welcome to come share their experiences and work on how to change these issues,” said Willey. The club will be classified as social, academic, support and professional organization. Its main goal is to build a strong support system for women in STEM at URI. “There’s nothing more supportive than a group of people just like you going through the same stuff,” said Madelyn Day, a sophomore PharmD student who is planning on becoming a member. Plans for the club also involve community outreach. Co-founders Willey and Dunkle are looking to extend encouragement, education and mentorship to young girls interested in pursuing a career in science. The next generation of women in the STEM fields needs the encouragement to be confident in their abilities and capabilities as a woman, despite sexism that exists, according to the co-founders. “If I had someone while I was in high school tell me that I might face these things, but assure me that it’s okay and I’m still important and able to handle it, I think I would have entered college more confident in my abilities,” said Willey. As an on-campus, student-run organization, Women in STEM plans to be represented at student organization fairs next year, including First Night, become Senate recognized and have inter-club networking events.